Mark Dodson's first Six Nations as chief executive of the Scottish Rugby Union was an unforgettable experience for all the wrong reasons. Andy Robinson's side had exited the World Cup in the group stage for the first time the previous autumn and now they were zero wins from their first four games of the championship and in need of a victory against Italy in Rome on the final day to avoid the Wooden Spoon. Not only would Scotland lose that game, they wouldn't even score a try in defeat. It was a performance that was reflective of the time - miserable. Things are changing, on and off the pitch. Last week, Dodson reflected on some of the live issues surrounding Scottish rugby. It was reported last month that the SRU were in talks with Newcastle Falcons about acquiring a stake in the Premiership club. The union said little about it at the time, but Dodson is expansive now. Is getting a piece of the action in England of interest? You bet it is. "There's been a lot of noise about the union wanting to partner with an English club," he said. "First it was Worcester and now we have Newcastle. "It's our desire to get involved in the English Premiership. It's a league of great importance and it's a way that we can, perhaps, gain access to a third [professional] team, because it's probably impossible in Scotland, given the economic climate, to have a third franchise." Dodson needs to achieve some version of a third franchise, a place where rising stars of the Scottish game, as well as aspiring coaches, get to spend all, or part, of a season at another club while not quite in the picture at Glasgow and Edinburgh. Ireland, the Grand Slam champions, have four provinces and the growth in player depth in recent times has been extraordinary. Young talent has been given every opportunity to play and develop. That opportunity doesn't exist to anything like the same extent when you have just two fully professional sides. Semore Kurdi, the owner of the Falcons, said in February that "what we are talking about is a marriage and we haven't even gone on our first date". The signs are, though, that this is a project that both parties might sign up for. The Falcons frequently lose more than £2m a year. A deal with the SRU could see them cut their wage bill while still recruiting players of talent. "We've been looking at the English Premiership for the last three years," said Dodson. "It's just about finding the right partner in the right place. "It's too early to say what a Newcastle deal would look like. We're just having conversations with several people, but we would like to work with them in a partnership. It would give some of our players the opportunity to taste what it's like in the Premiership. "We all believe in the financial strength of that league. It's a good, strong league and it will only get stronger. "In this day and age we have to be seen as both global and local. For us to stay in a country of five million people and say, 'no, we're happy with that', just flies in the face of logic. "Everybody wanted to crack America but it's very difficult to crack that market because it's so diverse and it's difficult to understand where the game is going over there. But there's much more than America going on." The SRU already have a tie-in with Stade Nicois, who operate in the fourth tier in France. They've already placed players with the Nice club, some youngsters in need of wider experience, some older players who want to develop their coaching with retirement in mind. As ever, there's a financial dimension to all of this. "It's a perfect example of us trying to understand another massive rugby market," Dodson said. "Our partnership allows us to understand it from the inside out. We have a really strong relationship with the city of Nice and with Allianz, who are their principal sponsors. "These are good on-field and off-field developments. Our ability to give our coaches and players an experience of the French market, under controlled circumstances, is massively important for a country of our size. There may be a financial benefit down the line as the club develops." 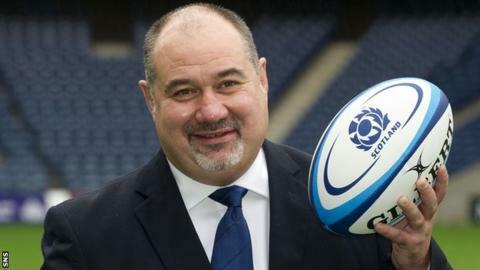 There was some suspicion and a degree of rancour when Dodson announced that the structure of club rugby in Scotland was going to be altered dramatically from season 2019-20. He'd already described the existing Premiership as "not fit for purpose" and he now doubles down on that by saying that it's the "weakest amateur tier of rugby in the UK" and that "we're falling further and further behind". The plan for the season after next is a Super 6 competition, consisting of franchises, sitting atop a structure that has four fully amateur leagues underneath. Player payments in the four leagues below will be outlawed, to the point of reporting any under-the-counter payments to players to HMRC. Hardball, in other words. There will be no promotion into or relegation from the Super 6. The SRU will contribute £62,500 per club, per year for squad building and £75,000 per club, per year for coaching and the wider performance programme. Whatever else these franchises end up costing from season to season will have to be met from their own funds. This is a bone of contention. Some critics of the plan have crunched the numbers and have concluded that the shortfall between what is funded and what they will have to find could be as much as £130,000. Since the announcement, there's been mass debate. Some within the clubs have accused Dodson of exaggerating the deficiencies of the current Premiership and playing down its successes. Others have questioned what this plan would do to the heart and soul of historic clubs. As one critic put it: "Dodson is relying on fear of being left out in the cold to drive clubs towards gambling their own identity and long-term sustainability on a scheme they are far from comfortable with". Dodson's response? "If you listen to the people who bleat the loudest, they are the people who least understand it and who don't want anything to change," he said. "Change is great when it's not happening to you, I find. People who are still banging on about it are either ill-informed or will never change anyway. "There's a group of people in every union, and ours is no different, who keep pointing back to the glory days. Well, I've tried to find these glory days over the last 30 years and I'm struggling. I can't find this period when everything was wonderful inside Scottish rugby. "Nobody is being coerced into this, nobody is being forced to apply. We have been mandated to reform club rugby. The clubs have mandated us to do it and Super 6 is the solution. "This is part-time professional rugby, not semi-professional. Everybody who plays in that league will have another job. "We have more than enough people who are going to apply for this. My problem will be dealing with the clubs that don't actually win. It's dealing with the disappointment of those not part of the Super 6 that is going to be the challenge. "The numbers I hear from those who don't want it are wrong. We've estimated that most clubs are paying between £60,000 and £80,000 on their squads at the moment. "We say the cost of squads in Super 6 will be £125,000 and we'll produce £62,500. So there's a saving there. We will pay for the coaching. The people who don't want this to work are purposely putting numbers out there that are untrue. "I've had about 40 meetings with clubs and there is an understanding now around this. We've had 13 letters of intent. That's 13 clubs, or an amalgamation of clubs, that are interested in delivering on this. "They might have an education establishment or college as part of their bid, so that will automatically liberate facilities and expertise and a ready-made audience. We've have had positive conversations with lots of universities. "The Super 6 will look nothing like the Premiership as it currently does. It'll be dressed differently, it'll be promoted differently. It will be part of our high performance department, so it will be looked after by our professional rugby people." The criticism of the Super 6 from sections of the club game is that it's tantamount to an SRU takeover, that the union will make all the big staffing decisions in the new franchises, including the head coach appointments. "Don't forget, we have been asked for this," Dodson said. "The clubs - National 1, 2 and 3 - demanded that there was a stop to paying players at that level, it was distorting the whole game. "We have clubs paying players and they can't afford to pay them so they spiral down the leagues. Clubs that should be spending on facilities and coaching feel that they have to pay players to compete. This is an amateur game. "If you want to change things in Scottish rugby you have to push it through. There's an inertia here. People want things to stay the same. The game is not like it was 30 years ago. The game has moved on completely." The franchise winners will be announced on 1 May.